I am always looking for new ways to use my sourdough starter. 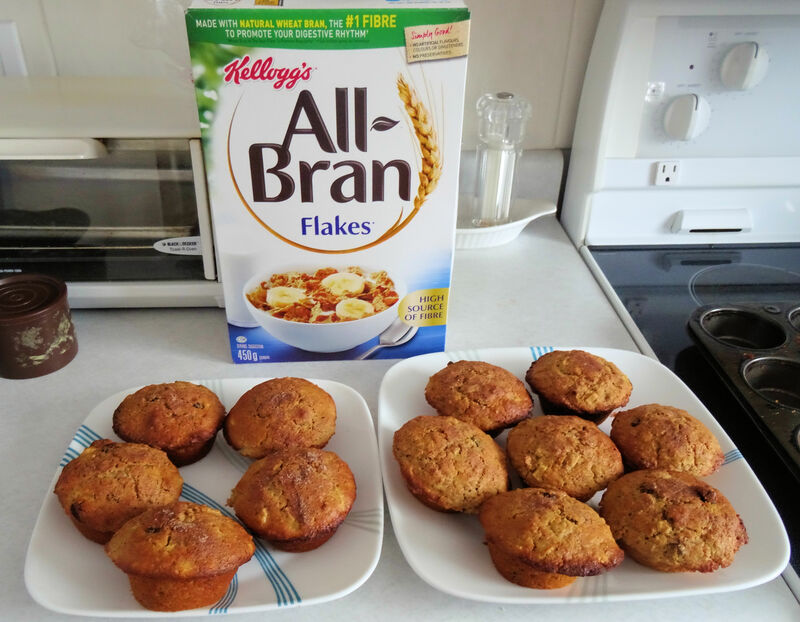 I wanted to do a sweet muffin so I converted a recipe from the Kelloggs www.allbran.ca site, Harvest Apple Muffins. I reduced the flour and milk and added a cup of sourdough starter. I started by combining the sugar and cinnamon for the topping and coring and chopping an unpeeled apple. Then I mixed the flour, sugar, baking powder, cinnamon, salt and nutmeg in a large bowl. In a smaller bowl mix together the bran flakes, milk, sourdough starter, egg, vegetable oil and molasses and beat it. Stir in the apple and raisins. 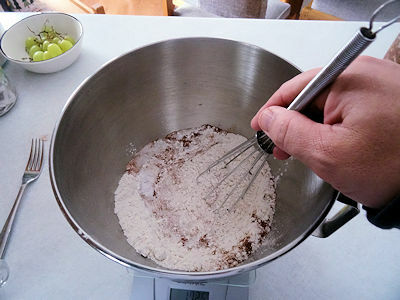 Add the liquid ingredients to the flour mixture all at once and stir just until the flour is moistened. Put the batter in greased muffin pans. Sprinkle the sugar/cinnamon mix over the batter and bake in a 400 F oven for 20 to 25 minutes, until golden brown and set. Let them cool for 5 minutes and take them out of the muffin pans. This worked very well. 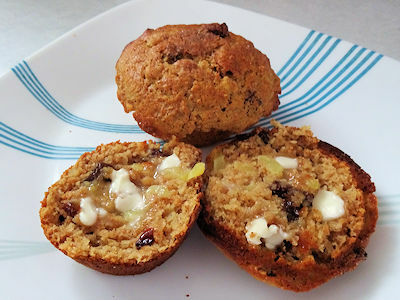 The muffins have a touch of sweet without being cake like. The sourdough gives a nice counter point to the sweet and apple. The muffin tops crisped perfectly. Sigh, breakfast is going to be good for the next couple of days. Mix sugar with cinnamon and set aside. Mix flour, sugar, baking powder, cinnamon, salt and ground nutmeg in a large bowl. In a smaller bowl, mix together bran flakes, milk, oil, molasses, egg and sourdough starter. Beat the mixture. Add apples and raisins to liquid mixture. Add the liquid ingredients to the dry and stir just until mixed and moistened. Put the batter in large muffin tins that have been sprayed with baking spray. Sprinkle cinnamon and sugar mixture over top. Bake for 20 to 25 minutes until golden brown and the top springs back when touched. Let them cool for 5 minutes and turn out of muffin pan. Hi, thanks for sharing your delightful muffin, it look really good. 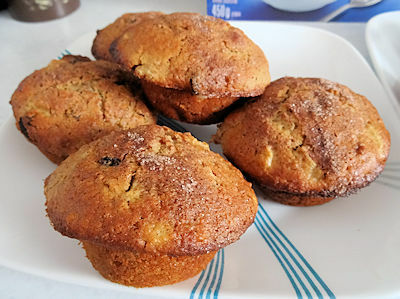 Apple, raisin, cinnamon, nutmeg are the best combination, while baking I’m sure your kitchen smell heavenly. Thank you for the Christams wishes and the same to you! The house did smell terrific and they were great for breakfast this morning.